Fiore del Frantoio Extra Virgin Olive Oil is the result of the mariage of Tuscan varieties (Frantoio, Leccino and Olivastra) from Val d'Orcia and Peranzana, Coratina and Ogliarola from Torremaggiore and San Severo in Apulia. Its a mild extra virgin olive oil with a light spiciness at the end. It is ideal for salads, fresh vegetables, bruschetta, fish, stews or frying. 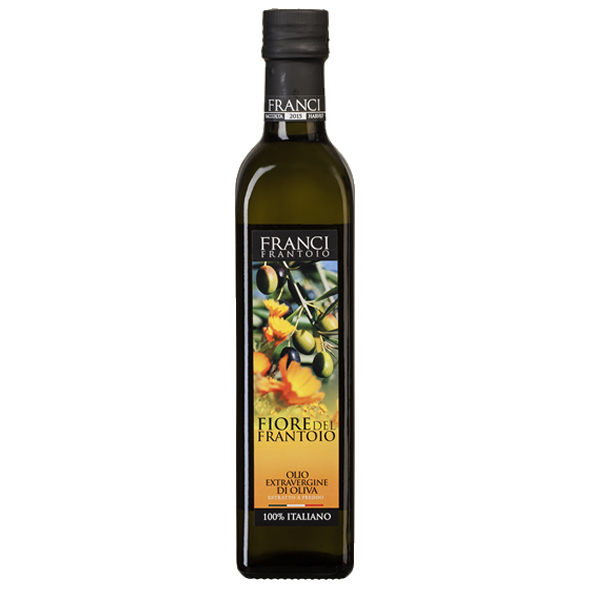 It is produced by Frantoio Franci, one of Italy's most renowned olive oil producers. The farm, based near Montalcino in Montenero d'Orcia is currently managed by Giorgio Franci, having taken over from his father Fernando. The mill quickly became famous through its flagship Villa Magra Grand Cru, which has long been regarded as the pioneer on the segment of olive oils of the highest quality. Frantoio Franci progressively expanded its range to cover a large selection of oil form delicate to intense. It is one of of the most awarded olive oil producers in Italy and has received the highest score of 98/98 by Flos Olei, the international olive oil guide.